When Will You Be Off Paper? likewise steel & razor wire. 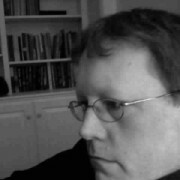 Ace Boggess is the author of two books of poetry: The Prisoners (Brick Road Poetry Press, 2014) and The Beautiful Girl Whose Wish Was Not Fulfilled (Highwire Press, 2003). His writing has appeared in Harvard Review, Mid-American Review, Atlanta Review, RATTLE, River Styx, Southern Humanities Review and many other journals. He currently resides in Charleston, West Virginia.